This was recently brought to my attention in an email. "The company is owned by PDV America, Inc., an indirect, wholly owned subsidiary of Petróleos de Venezuela, S.A., the national oil company of the Bolivarian Republic of Venezuela." 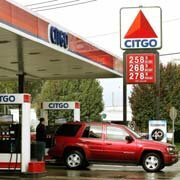 So as I understand it, Citgo is indirectly under the control of the Venezuelan government. That is to say, a government head up by a man who called our president Satan in front of the U.N..
Take that into consideration next time you dump the contents of your wallet into your gas tank. - I agree with this post in it's entirety. In fact, I find it hard that this is the only example of what I consider the corruption of our nations financial and political landscape that can be dug up. Kudo's on bringing this one to my attention. Afterall, the idea of our nation being dependant upon a global economy I'm sure plays a large role in this. There's no telling the number of villains that have a financial foothold in our country... foreign and domestic.